We all know that exercise is good for us. Being active is important no matter how old you are. But especially for kids, it builds strong muscles and bones and it helps keep their weight under control. It is scary to see that at least one in seven preschoolers is already overweight, and that number goes up in the elementary and middle-school years. Being overweight at a young age can lead to obesity in adult years, which will bring along conditions like diabetes, heart related issues and even cancer. To avoid all of that, just one hour of exercise per day, starting in a young age will change your life! After a day that includes exercise your child will sleep better and be happier. He or she will likely be more motivated in school and more successful in life. And mastering any activity that involves other children will build self-esteem and social skills. So what are we waiting for? Let’s get started! By being a good example you can put a stop to that in your own home right now. An obese parent has a 50% chance that their child will be obese as well. Sometimes the word “exercise” sounds like work. Change that word to “play” and you probably get a more enthusiastic response. YAY! Everyone wants to go play! So let’s do it TOGETHER! YOU have to be the role model. Put the remote control down, push back from the computer, take your feet off the coffee table. Hide the chips. You don’t have to tell the kids that exercise is good for them. Tell them they’re going to have some FUN. And you can have fun right alongside them. Once they get the hang of things and can play on their own, you can do whatever you like. But remember… they’re watching you! And if you want them to build these good exercise habits for life, it’s more than helpful if they see that you have them as well. NO YELLING! If an activity isn’t fun, a kid won’t do it. They can dig their heels in like nobody’s business. They run funny? That’s okay. They don’t get the racket back? That’s okay, too. They keep missing the hoop? They’ll get better. 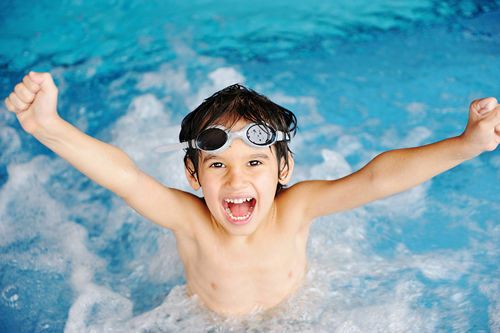 Find the activity or sport that appeals to them and just keep the encouragement and cheers and big wide smiles coming. Don’t forget that it’s not the outcome that matters, it’s the journey. The fun journey. 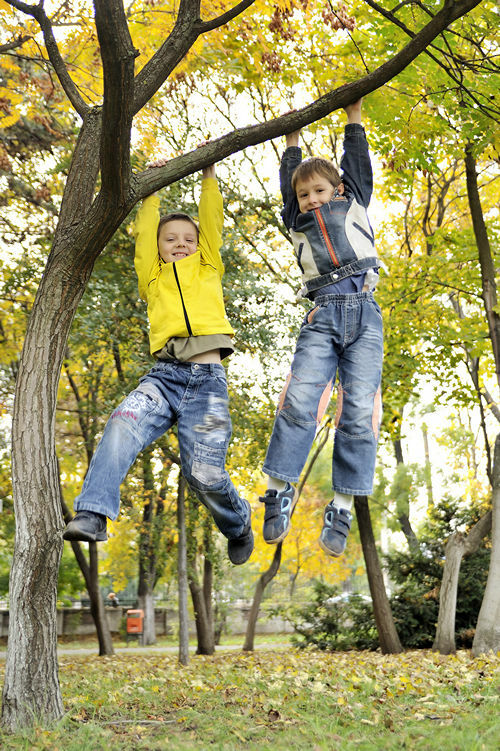 Preschoolers need play and exercise that helps them develop important motor skills. Think back to when you were a little kid. You can kick or throw a ball, you can hop! You can play follow the leader or play tag. 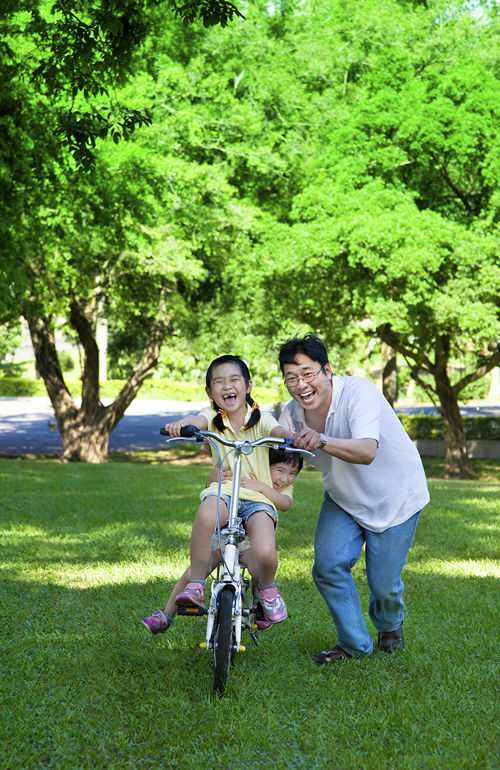 You can start to learn to ride a tricycle or a bike – don’t forget the training wheels! You can run a little obstacle course. You can swing on a swing and pump your legs as hard as you can! You can play miniature golf. You can learn how to swim. You can go bowling. You can do a somersault. You can dance! Think of grown-up things that little people can do. 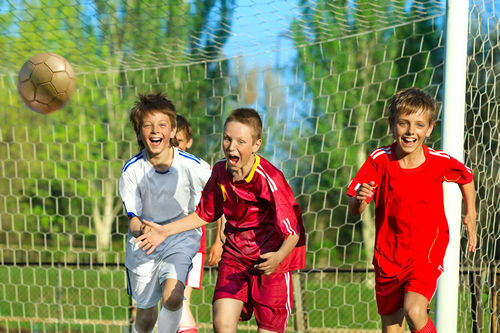 Although some sports leagues may be open to kids as young as 4, organized and team sports are not recommended at this age. 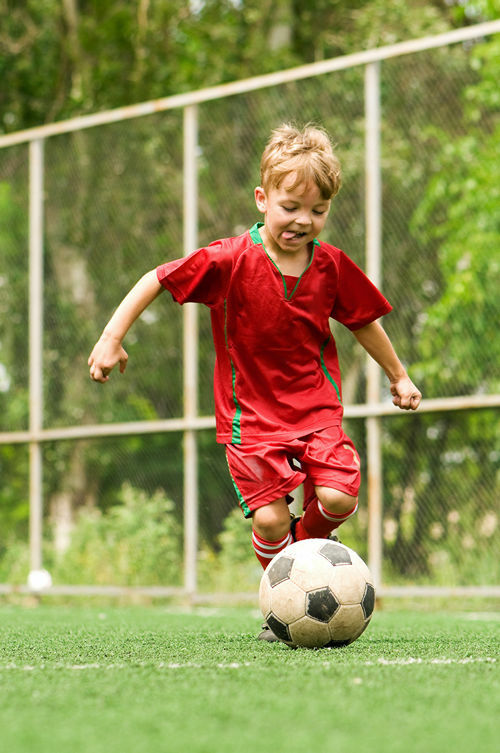 Preschoolers can get confused by complex rules and often lack the attention span, skills, and coordination needed to play sports. And that might lead to frustration and… uh-oh…tears. 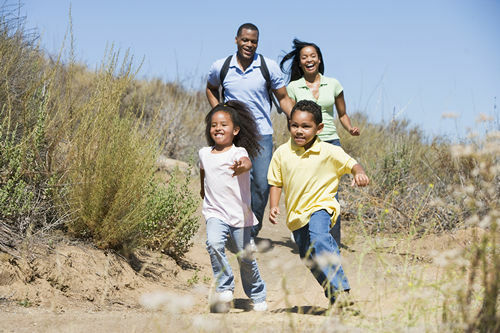 Depending on where you live, you might find more or fewer activities for your child. Ask your neighbors and friends for suggestions. Do your have a pool in your community? When you watch the Olympics, what gets your little one up and on his feet clapping? School-age kids, left to their own devices, will spend a mind-boggling amount of time on sedentary pursuits like watching TV and playing computer games. Your challenge will be to help them find physical activities they enjoy and feel successful doing. These can include almost anything from soccer to baseball and basketball to martial arts, biking, hiking, ballet or tap and gymnastics. You might even have an archer in the house. As kids get older, differences in ability and personality become more apparent. Commitment and interest level often go along with ability, which is why it’s important to find an activity that’s right for your child. And don’t forget that interests change. What was fun yesterday might be a big yawn today. You don’t have to be raising the next Tiger Woods or Serena Williams. 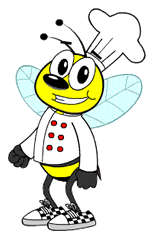 You just want to raise a kid with confidence and one who will get off her bee-hind and stay fit! 1. Limit screen time. This is the no-brainer. The American Academy of Pediatrics recommends that kids get no more than one to two hours of screen time a day, whether that’s watching TV, surfing online, or playing video games. But many children spend four or more hours each day in front of a screen. To keep an eye on things, remove TVs from bedrooms and put the computer in a shared space where you can supervise. And no phones or TV while you eat together. That’s your time to talk and share a good meal. 2. The morning march around the house. Morning march? Once everyone is up and out of bed, teeth washed, assemble the pajama-dressed troops, sing out, and march in single file around the house. Upstairs and downstairs if you’ve got ‘em. If not, go around and around the living room and kitchen or into any other rooms of your house. This will wake everyone up and once you start singing in the morning you might find everyone at least humming the rest of the day. You can take turns leading the march, or have a designated (your littlest one?) lead the parade. 3. Can you buy or borrow a few basics? You don’t need a home gym, but if you have some active toys in reach, you can have fun anytime. Think about jumps ropes, a beach ball, a game of Twister. A hula hoop. One for everyone in the family! 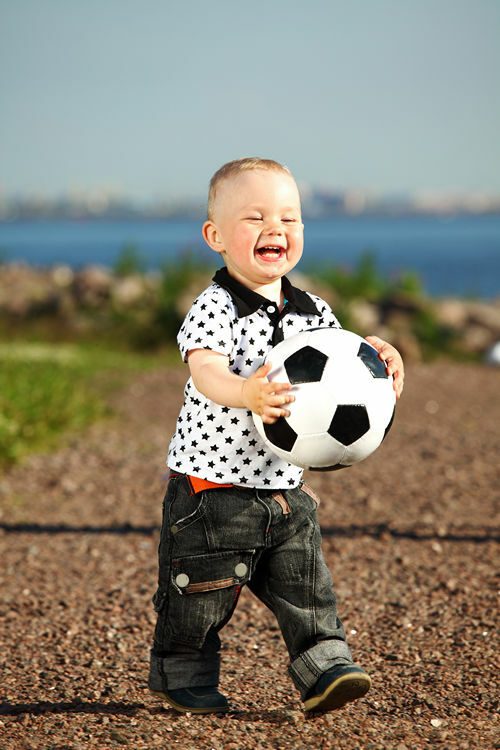 If you have room to play outside, you might like a basketball or soccer ball. Toys like this encourage kids to get out of the house! 4. Walk! Don’t park near the entrance to the store or library. Or anywhere. Take the stairs instead of an elevator or escalator. Look at what’s around you and talk about it. 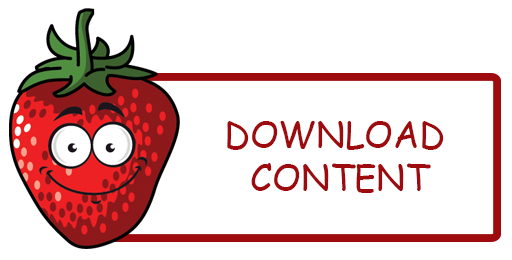 Make up a story about the people you see to keep your kids entertained. Talk about where you’re going to set a goal. Then it will feel easier to get there. 5. Run! There are so many charity run/walks that you and your child can take part it. Find a charity that suits you and make a difference. Your child will love seeing everyone else out there. And it can be a family activity to spend time “in training” for this event. Depending upon the fitness of you and your child and other family members, don’t even think about having to make it to the finish line. Just get out and have some fun. The fact that you did this at all is the reward. 6. Exercise can be a reward! Everyone likes a break from homework or helping around the house. “If you help me clear the table we can play kickball for twenty minutes!” “When you finish that chapter you can shoot some hoops for half an hour!” This isn’t exactly bribery, but it will get the job done and will give your child something to look forward to. 7. And speaking of getting the job done…vacuuming and washing windows use up a ton of calories. Let the kids help. See how high they can reach to clean a window! You do the top. Make a face in the foam – if you use a foaming cleaner – before you wipe it away. 8. Invite a friend. Kids love to do things with their friends. Go to a playground or the park or the local pool. If it’s not a nice day, stay inside and crank up the music and let the little ones dance to the beat. If they’re older, is there a sport or activity they’d like to try together? The more time your child spends having face-to-face time with others, the more his social confidence and abilities will grow. 9. Make a routine. Is there a time during the week when you can all do something together? 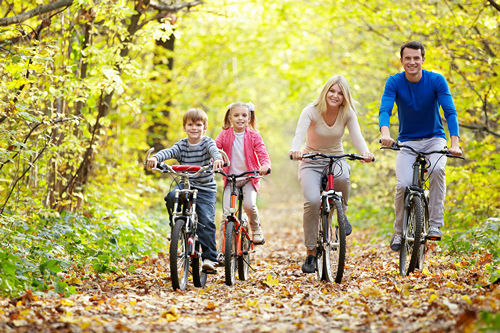 A family bike ride or hike every Saturday morning is something to look forward to. Can you all take a walk around the neighborhood after dinner? Make it a reward for after the dishes are done! 10. Gardening gets you outside and gets the blood going! Fresh air and sunshine are mood and vitamin D boosters, as well. Work on your child’s garden and enjoy the benefits of growing your own food and the exercise that comes with keeping everything healthy and beautiful. Do you have to rake the leaves? Play in them before you scoop them up. Make a game out of weeding. How many weeds did you get? Have to bring the wood inside for the winter? Even the littlest member of the family can bring in some small branches. Ah, the satisfaction of helping, haha! Or do you live near a forest? A walk through the forest is always an adventure in fresh air. You can jump across creeks or over tree trunks and if you are really quite you might even see different animals! 11. Little baby steps. Anyone can do just about anything for five minutes. If a grumpy face greets your suggestion of an activity, say “what about we just try this for five minutes?” You can count off the minutes. You can encourage that sixth minute and then that seventh. The next time you try it, you can start counting at seven and see how far you get. You can build in a reward when you hit a milestone. Twenty minutes? Half an hour? If after a few days your little one isn’t falling for it, give up and try something else. Remember, we’re here to have fun. 12. Is your family known for a sport? Do you come from a family of golfers or tennis players or bowlers? Skiers or swimmers? The little ones really want to do what the big kids do. Start them young and see how they make out. If it’s not the sport for them, make sure to find something else that that they can excel at and bring the rest of the gang out to cheer. What you don’t want to do is make him feel as if he doesn’t fit in with everyone else. He’s a star in his own right. 13. What would you like to do today? Kids love to be in charge. Let your child choose the activity once she knows that you’ll be doing something every day. Give her some options and be happy to go along with her choice. Praise her for how she knew just what you wanted to do! 15. Make it up as you go along. Play hopscotch on the street. Do jumping jacks if you have to wait in line someplace. Try some sit-ups when there’s a commercial on. Race to the school bus. Set up a scavenger hunt in the house on a rainy day. 16. Get video games that work up a sweat. There are games where children have to move around in order to win. YAY! They’re moving! Think about this at the arcade, too. 17. Not all activities have to be overly-physical. There’s fun and accomplishment in crafting, for example. Paint and draw and put a puzzle together. Play with clay. Cut shapes out and make a collage. Learn to sew. Learn to cook. HA! We’re all multi-faceted. Don’t forget to nurture the inner as much as the outer! Remember to offer positive feedback for everything that your child tries. It’s not how many times we fall down that matters, it’s how many times we get up! Out-of-shape or less coordinated children need to hear encouragement just as much as anyone else. But make it genuine. Be really proud of the extra steps taken or the extra effort it took. Some kids are just shy or might be self-conscious about their physical abilities. Your job is to give them the tools that will last a lifetime. Watch her beam when she sees how proud you are of her. It will mean the world to her. Forever. Wow, just the thought of all the different kinds of exercising you can do together makes me want to start running, haha! What do you do together as a family? 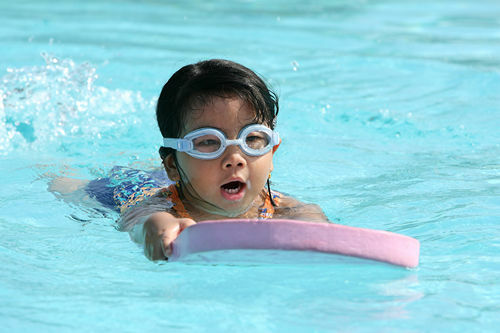 How does your little one stay active and in shape? Do you mind sharing it with us to inspire others?